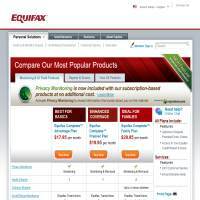 Equifax.com provides identity protection solutions for individuals, families and businesses, with a real focus on monitoring and protecting your credit scores and finances. The site is separated into “personal” and “business” sections, with a few additional areas that educate you in the ways of identity protection. The “personal solutions” section of Equifax.com provides credit and identity products, credit report assistance, customer support and education. The services provided come in three different packages, making it flexible and suitable for a range of situations and budgets. The cheapest of these is the advantage plan, which provides privacy monitoring for one adult, with up to $25,000 identity theft insurance and financial alerts for up to 2 accounts. You will also receive ID theft assistance and credit reports for one year, as well as lost wallet protection. As such it’s a decent package for an individual who is looking for basic identity protection, particularly with regard to keeping an eye on their credit ratings. The more expensive packages offer a wider range of features such as credit score monitoring and the ability to lock such reports. You can also include an unlimited number of accounts in your financial alerts and receive automatic fraud alerts. If you’re looking to keep your family safe then equifax also offers a family plan, allowing you to protect up to two adults and up to 4 minor children. One of the key functions of Equifax is the 'Lock/Unlock' function, which allows users to apply a 'credit lock' to their credit accounts, thus closing off access to their information except in specific circumstances. The idea is that users allow access either to specific companies only, or for a specific period of time, so that only legitimate applications for credit or transactions are allowed access to the credit account. Without access, no provider could provide credit services, and thus, identity theft is prevented. This service also performs extensive scans of the Internet (both public websites and data trading sites on the black market) and of various public records to search for protected data belonging to Equifax ID Patrol users. This scanning function is intended to highlight data that may be traded online, and close down access to such information by passing details on to the relevant authorities and preventing access to the relevant credit account. In addition to these measures, Equifax also allows all users access to 24/7 Identity Theft Resolution Specialists, who are specially trained to help users recover from the negative effects of identity theft and associated fraud. Users also have access to a range of support materials, a toll-free helpline and an online virtual assistant to help should any problems arise. The plans aren’t expensive but they’re certainly not offering the best value we’ve seen. However, the family plan does cover twice as many adults so you’ll make a significant saving through the family plan in comparison to purchasing two individual plans. Meanwhile the business services seem a lot cheaper, particularly given the fact that they’ll be dealing with a lot more information. This seems somehow backwards to us, but who are we to argue with their pricing decisions. Many of the services seem to lack a protective element to them, which is to say that they monitor your information but don’t really go to any lengths to reduce the likelihood of your information being used. Some identity theft protection websites actively seek out your name and address, checking if it’s being used and attempting to remove it from databases. Some also provide data breach services which help to prevent your information from leaking further, whilst professionals attempt to delete negative records from your name. Such services don’t seem a focus of Equifax, which is disappointing. If you are looking to keep a closer eye on the business finances and credit records then the site offers services for both small and large businesses. These include risk management and – for larger companies – marketing solutions and data management options. The layout and content of the site seems more suited towards the business end of identity theft management as it doesn’t always speak in the simplest terms and many of its services seem primarily focused around credit, rather than personal identity issues. As such this might be a site to check out if you’re interested in protecting your business, rather than your personal identity.